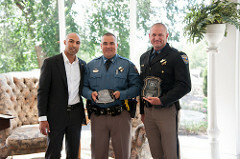 On July 22, 2016, six Colorado State Patrol workers who put their lives at risk in order to protect the safety of the public were recognized for their heroism. 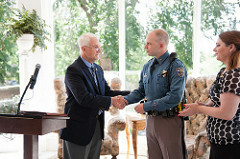 Members of Citizens Appreciate State Troopers (C.A.S.T.) presented awards to Troopers Gregory James, Clinton Rushing, Dwayne Massner and Derek Pollard, and to Communications Branch Training Coordinator Stephanie Chataignier. Trooper Jaimie Jursevics, who gave her life in the line of duty last year, was also honored with an award that was accepted on her behalf by her husband, DJ Jursevics. C.A.S.T. is a volunteer citizens' organization dedicated to acknowledging outstanding Troopers who serve the public above and beyond the call of duty. "The general public only sees the uniform and the badge and the gun; they don't see the people and the families behind those," said Steve Bock, a member of the Board of Directors of C.A.S.T. who presented DJ's award to her husband. The awards aim to highlight the stories, heroism and sacrifice of the people behind the uniform and the badge. 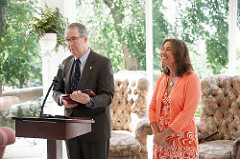 The awards were presented during a ceremony at the Governor's Mansion. On January 22, 2015, an attempt to stop an erratic and unsafe driver turned into a pursuit with a dangerous and unstable suspect. When Trooper James stopped the suspect and attempted place the man into custody, the suspect refused to obey commands and began yelling. This escalated until he attempted to disarm Trooper James and take his firearm. On the ground and fighting for his life, Trooper James was able to fire his weapon; it did not hit the suspect but instead caused a malfunction of the firearm. Trooper James was able to strike the man and gain distance, fix his weapon, and order the subject down. The man indicated he wanted to be killed, a “suicide by cop,” and again tried to rush and fight Trooper James. In an incredible act of restraint and calm, Trooper James was able to use the appropriate level of force necessary to control the suspect and to take him into custody. On April 1, 2015, Stephanie was was headed home after working her shift when she noticed slowing traffic and an ambulance on the eastbound ramp from Kipling to I-70. She observed a young woman in distress, walking into the road and back to the shoulder multiple times. As paramedics attempted to help the young woman, she fled. Realizing that this person was about to run onto I-70 and that the paramedic could not respond in time, Stephanie got out of her vehicle, approached the woman, and attempted to calm her down. The woman pulled away and quickly became combative, fighting to run into the roadway. Stephanie managed to hold onto the woman, preventing her from injuring herself or anyone else as the paramedics assisted. Ultimately Stephanie was able to calm the woman down as she received proper medical attention. Her quick action and compassionate intervention likely saved the woman from injury or death, and potentially prevented motorists from being injured in the incident. On May 23, 2015, Trooper Clinton Rushing and Cadet Trooper Taylor Thyfault were assisting a Boulder County Trooper with an accident investigation on Colo. 66. While on-scene, Trooper Rushing heard that another trooper was involved in a vehicle pursuit of a fleeing suspect and was headed toward his location. Trooper Rushing notified Denver Communications that he was in position ahead of the fleeing vehicle and that he would set up stop sticks in an attempt to end the pursuit. Trooper Rushing was struck by the fleeing vehicle and sustained serious bodily injury, including permanent disfigurement and impaired function of several parts of his body. Cadet Trooper Thyfault was struck and killed. 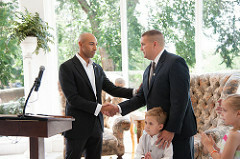 Thyfault was honored in 2015 for his ultimate sacrifice with a CA.S.T. award. Trooper Clinton Rushing acted with outstanding courage and placed himself in a position of great risk in an effort to end a dangerous pursuit that was endangering all motorists on the highway. As he was still hospitalized at the time of the 2015 C.A.S.T. awards, he received his award in 2016. After crashing a vehicle early on the morning of June 6, 2015, a man left the vehicle and began walking into oncoming traffic with a gun to his own head. The man used the gun to carjack a vehicle from a passing motorist. Trooper Massner had been called to respond to the single-vehicle rollover. As he was catching up to the suspect, Trooper Derek Pollard responded to the incident and deployed stop sticks, which successfully deflated the right front tire of the stolen vehicle. Trooper Massner followed the man to the exit ramp and completed a successful tactical vehicle intervention. The man rolled the stolen vehicle off the road and down an embankment. Undeterred, the suspect opened fire on Trooper Massner and Trooper Pollard. Despite facing gunfire, Trooper Massner and Trooper Pollard were able to keep the suspect contained in the immediate area with a single gunshot as other law enforcement arrived. The suspect then ran across the highway with his firearm. Trooper Pollard followed in his patrol vehicle. Seeing that the suspect was about to attempt another carjacking and fearing for the safety of other motorists, Trooper Pollard rapidly accelerated toward the subject despite the potential threat to his own life. The maneuver worked: the man leapt away and the motorists left the area without harm. Troopers Massner and Pollard cornered the man against a fence and continued to try to negotiate with him for a peaceful resolution. He continued to refuse to cooperate, pointing his gun at himself and the officers. Ultimately, he was stopped by a shot from an Arapahoe County Deputy. On the evening of November 15, 2015, Trooper Jaimie Jursevics stopped her patrol vehicle on the inside shoulder of I-25 south of Castle Rock in an effort to protect the scene of a crash being investigated by a fellow trooper. While stopped, she was notified of a possible drunk driver headed southbound on I-25 and learned the suspect vehicle was approaching her location. Trooper Jursevics immediately began attempts to flag down the suspect vehicle from outside of her patrol car. Moments later, the reported drunk driver collided with Trooper Jursevics, killing her instantly. The suspect vehicle fled the scene but was apprehended by the Palmer Lake Police Department approximately 15 miles from the crash scene. The suspect was taken into custody and charged with vehicular homicide, leaving the scene of a fatal crash, driving while under the influence and several other offenses. Read the full stories of these outstanding individuals in the CAST Awards program.